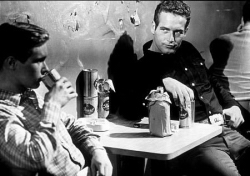 In 1963, Paul Newman was smack bang in the middle of a decade of classic filmmaking that included Cat on a Hot Tin Roof, The Hustler, Hud, Cool Hand Luke and Butch Cassidy and the Sundance Kid. Widely regarded as his best performance amongst those greats, Hud is a bleak look at the conflict of generations, and the search for identity. Hud Bannon is the middle generation represented on the farm he grew up on – his father Homer (Melvyn Douglas) is the patriarch and his nephew Lonnie (Brandon De Wilde) – his dead brother’s son – the youth. Lonnie is being raised by his grandfather to live by certain ideals, but instead he idolises his womanising, disrespectful uncle. The ensuing battle over Rightness, Honour and Integrity forms the basis of the film. Newman himself is wonderful as Hud, bringing a wild-eyed anger and a burning frustration to the title role. Hud is dissatisfied with his role in life, can’t see any way out, and behaves as such. You don’t look out for yourself, the only helping hand you’ll ever get is when they lower the box. From adultery to drunkenness and brawling, he is spiralling downwards, and knows it – and he just doesn’t care. This is an amazing character for a Hollywood that was generally turning out ‘heroes’ and was yet to realise the potential of unredeemed evil to entertain. Brandon De Wilde as Lonnie is also excellent, and demonstrates the conflict he feels at his idol’s actions as truly as he does his love. For while he despairs at Hud’s treatment of his grandfather of whom he is truly fond, he also longs to be just like him. He sees Hud’s success with women as a roadmap, and he longs to be accepted as his equal. Much like many other films in which this prototypical relationship is utilised, it is the eventual realisation of the fallibility of the one idolised and the development of his own beliefs and behaviours that will define Lonnie. Little by little the look of the country changes because of the men we admire. You’re just going to have to make up your own mind one day about what’s right and wrong. Hud is not only about finding one’s path, it also speaks to generational attitudinal change and the flexibility and fluidity of concepts like respect and honour. Homer Bannon is incapable of behaving in the way his son does, and has no frame of reference that allows him to even understand him or his actions. Hud Bannon sees the world differently, and thinks he can do things better by doing them easier. He cannot fathom his father’s stubborn approach to what he believes is right. This leads to a breakdown of communication that is complete, and irreversible. Even when, in the final moments of Homer’s life, we think Hud might bend just a little and feel something for his father, the film refuses to take that route. It is this rock-hard attitude to difference that marks this film as something special. 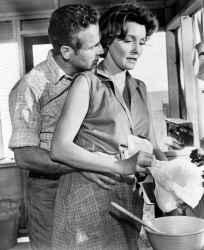 Rounding out the offerings is a wonderful supporting performance by Patricia Neal. Best known (to me at least) as 2-E, William Holden’s keeper in Breakfast at Tiffany’s, she is amazing as housekeeper Alma. With a definite and overt sexuality that is surprising for a woman in her late thirties at that time, Hud zings when she is onscreen. Neal is warm, sensual and sassy, and the moments she shares with Newman are cinematic truffles. That she was rewarded with a Best Actress Academy Award is no surprise. Also receiving an Oscar was Cinematographer James Wong Howe, who not only brings to life the Texan wilderness, but perfectly complements the barren lives of the characters with his shots of the wastelands they live in. Forming another character in Hud, the land, the dirt, it is all vividly detailed. Hud is not a perfect film, and there are moments that I feel drag a little. Incredibly bleak and without the happy ending one might expect, Hud is, however, very surprising, and it does feature some stunning performances and an insight into family and the passing of time that make it worth the effort. This entry was posted in Film Reviews and tagged Classic, Western by Mark Lavercombe. Bookmark the permalink. Writer: Larry McMurtry, Irving Ravetch, Harriet Frank Jr.